Calendars customized with a company’s colours are a classic in terms of chic low-cost communication. Within your company or as a customer gift, they serve as a reminder of your brand’s presence and values throughout the year. Printed on resistant materials, you can request any format, from small to extra large ! No need to create your calendar from A to Z. We provide our customers with many models that can be customized according to your requirements. We deal with all print quantities, even tiny ones! Sense of reading in portrait or landscape format. Our wall calendars can be printed onto matte or glossy paper. In order to better customise your product, you can also add an optional cover page to your calendars. You can choose between a perforated page system (the page detaches each month) or a metal spiral for your wall calendar. 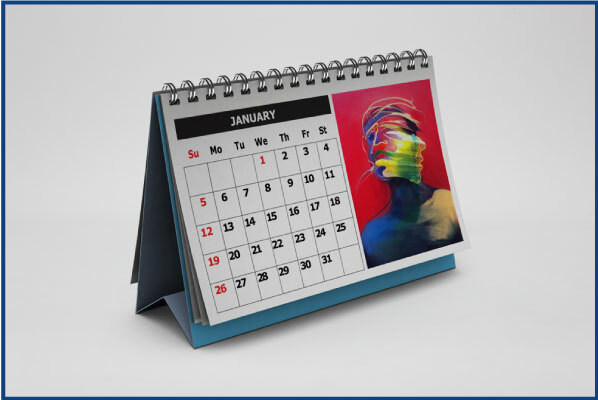 Office calendars, always a practical and decorative element in the workspace, are useful for quickly noting appointments or other useful information. They are always at hand. Possibility of custom printing bridge type or office set type calendars. Feel free to ask our team for help in customising your calendar according to your needs and the style of your business.